The decision of Dow Chemicals, which took over $130 billion all-stock merger with US chemical giant DuPont last week, with the combined company to be named DowDuPont, has made top international NGO Amnesty to declare this doesn't absolve if of Bhopal gas tragedy in which 22,000 people died in 1984. “DuPont must know that the unresolved human rights and liability issues around Bhopal, including the outstanding criminal charges against UCC, will not go away because of the merger. It must push its new partner to address its toxic legacy and assume responsibility for these issues that have plagued generations of victims and survivors”, it underlined. 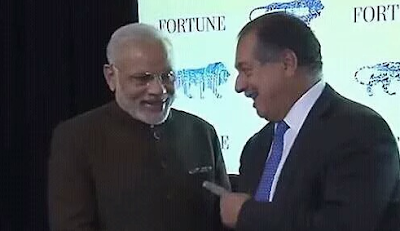 The Amnesty statement came close on the heels of the release of a photograph of Prime Minister Narendra Modi shaking hands with Dow CEO Andrew N Leveris. Amnesty said, the US chemical giant “must respond to court summons” and “stop dodging the Indian justice system and ignoring survivors who have suffered from the toxic fallout of the disaster three decades now”. The photograph, which is said to be of September 2015, it has been alleged, was "released" by the Prime Minister’s Office. In 2001, Dow acquired Union Carbide Corporation (UCC), the US-based multinational that was majority owner of the company that operated the Bhopal pesticide plant at the time of the leak. However, Dow has failed to respond to calls for justice and reparations from the victims and survivors of the disaster, while continuing to distance itself from the actions of UCC. “UCC itself has repeatedly ignored orders to appear before Indian courts to answer criminal charges of culpable homicide. The charges remain outstanding in India to this day. The chief judicial magistrate’s court has declared UCC an absconder from justice”, Amnesty said. “Calls for accountability and justice have haunted Dow since its acquisition of UCC in 2001. Dow, UCC and other companies are still facing a US$1.7 billion claim in relation to the disaster, and that’s just one claim by the Indian government based on a conservative estimate of injuries and deaths,” Amnesty said. In November 2014, after a hunger strike by women protestors, India’s Minister for Chemicals and Fertilizers promised to revise the numbers of deaths and injuries for which the government is seeking compensation in a US$1.7 billion dollar claim against Dow, UCC and others, to bring the figures in line with scientific data, medical research and hospital records. “However, local activist groups argue that no such corrective actions have taken place yet. Meanwhile, pollution from the abandoned Bhopal factory site that has contaminated the local water supply is yet to be remediated and continues to put the health of surrounding communities at risk”, Amnesty said. “Prime Minister Modi’s Clean India campaign must include a push towards accountability for Bhopal and a clean-up of the factory site. The government’s recent policy directives towards increasing penalties for environmental violations are noteworthy, but will hold no weight until there is justice on the ground for the people of Bhopal,” it demanded. He added, "Tomorrow we will see whether CBI helplessly watches Dow Chemical ignore court's order a third time or whether it musters the courage to take effective legal action against the criminal corporation."